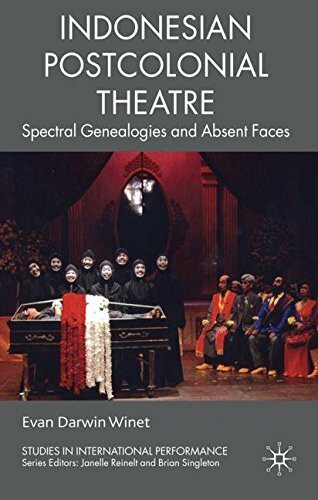 Indonesian Postcolonial Theatre: Special Genealogies and Absent Faces is one of a series of international theater studies edited by Janelle Reinelt and Brian Singleton. The appeal of this work, so richly illustrated with archival photos, plate reproductions, and stage shots, largely derives from the fact that Indonesian folk theatre is still a novelty to most Western followers of the performance arts. It is likely that ordinary tourists visiting Southeast Asia have seen shadow puppet shows or attended performances by Balinese dance troupes, but most are quite unaccustomed to the many different theatrical venues, styles and levels of folkloric representation available in Jakarta and upcountry. Winet, of course, is not aiming at tourist gawkers. His intended audience is rather the serious student of international theatre or the academic researcher. Unfortunately, the work does not present an easy path to the wealth of information. It is a sometimes tangled sprawl of local ethnic performance traditions, colonial apologia/anticolonial polemic, dramaturgy, and multiple perspectives stemming from inter-racial debates among the art forms’ practitioners. The book tries to cover thousands of years, many continents, and genealogies of theatrical practice, as well as drama theory, colonial history, social criticism, political perspective, and everything in between. Author Winet spotlights, in both the book’s title and in much of its central thesis, the postcolonial influences on the culture of Indonesia. The information, however, shows a wide range of influences and pressures that shaped, and continue to shape, that culture. The colonial forces, both the Dutch and, during World War II, the Japanese, created parameters and cultural constructs that informed all the arts in Indonesia. Internal dynamics, such as the varying potency of Islam within the country, or the intermittent rise and fall of Marxist thought—all brought new inspirations. For example, the ancient Indonesian theater Wayang Kulit shadow plays morphed into the currently familiar form partly to avoid the prohibition against representations of the human body in the Muslim faith. The rush of western influences that swept in after the war brought a resurgence of both the Indonesian cinema industry and the focus on western theater forms. As in many countries, political upheavals and repressions provoke the growth of agitprop theater troupes and productions. Western playwrights—Shakespeare is a prime example in Winet’s work—are re-interpreted to present or emphasize specific points of view. In one Indonesian version of Hamlet, the ghost of Hamlet’s father urges his son not to seek revenge, but rather to struggle for national unity and continuity of genealogical lineage. Winet’s encyclopedic approach results in a veritable treasure trove of facts and insights. His book is a worthwhile reference for researchers in the fields of international theater, Indonesian culture, and pan-Asian history. Reviewer Martin A. David is an author, dancer, choreographer, and former frequent reviewer for such publications as the Los Angeles Times.